Hearing loss is a chronic problem in the United States, one that affects 48 million people nationwide, or, around 20 percent of the entire population. The chances you know someone who has hearing loss are around 1 in 5. For most affected, hearing loss boils down to excessive exposure to loud noises or simply the consequences of aging. For some individuals, though, hearing loss is a sign of a less common condition. Consider six poorly understood hearing and balance disorders you should know more about. Benign paroxysmal positional vertigo involves dizziness related to a collection of calcium carbonates crystals, or “ear rocks,” that form inside the inner ear. The medical name for these crystals is otoconia. The otoconia typically occur due to a head injury, an infection, or similar disorders. Symptoms of BVVP include dizziness, poor balance, lightheadedness, and nausea. They may worsen with changes in head position. This condition can heal without intervention, but there are treatment options available including head exercises designed to move the crystals out of the inner ear structures. Drug therapy is also sometimes used and, occasionally, surgery. Labyrinthitis is based on swelling and irritation that affects the inner ear and hearing nerves – usually related to a viral, or less commonly, a bacterial, infection. This inflammation interrupts the transmission of sensory information to the brain, causing difficulties with balance, hearing, and even vision. The treatments generally offered include antiviral or antibacterial drugs and therapies used to control the symptoms of dizziness or nausea. If quickly diagnosed and treated, labyrinthitis usually causes no permanent damage. However, if left alone, permanent hearing loss can result. Ménière’s disease is an inner ear condition that leads to vertigo, progressive hearing loss, ringing in the ears, and a feeling of fullness or pressure in the ear. The cause of Ménière’s disease is not fully understood but it might be a combination of several factors, including poor fluid drainage of the inner ear, unusual immune response, viral infection, genetic predisposition, and head injury. Treatment options include medications for vertigo, hearing aids for hearing loss and tinnitus relief, antibiotics to treat infections, and surgery for severe cases. An acoustic neuroma is a rare, benign tumor of the hearing and balance nerves that disrupts the transmission of hearing and balance data to the brain. Although this tumor does not spread to other organs, it can become large enough to cause hearing loss and balance problems. There are over 5,000 cases of acoustic neuroma annually in the US. Treatment generally includes surgical removal of the tumor or radiation. Without treatment, the acoustic neuroma may eventually push into the brain, threatening neurological function and even life. 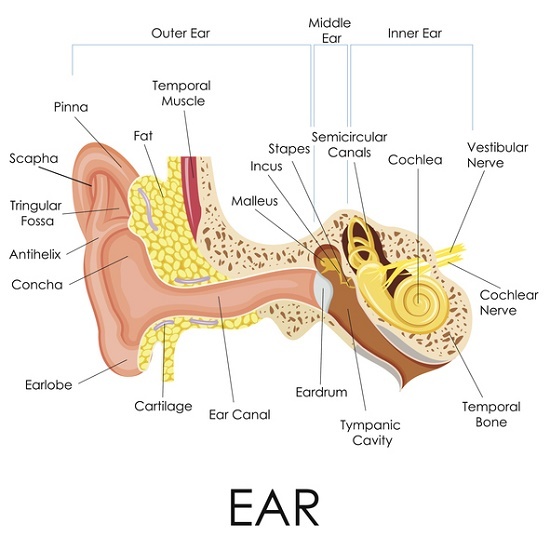 Autoimmune inner ear disease is an uncommon but progressive condition directly related to the immune cells attacking the mechanisms of the inner ear. Like most autoimmune disorders, the cause is not well understood. Symptoms can include hearing loss, balance problems, and tinnitus. Diagnosis includes hearing tests and also blood tests to check for general autoimmune disease. Treatment opportunities are limited but growing, currently; they include some combination of steroids, other medications, plasmapheresis, and hearing aids or cochlear implants for hearing loss. Otosclerosis is a problem that involves the hardening of bones in the inner ear bones. These bones are critical elements in the transmission of sound vibrations to the inner ear and then to the brain. The hardening of these bones interferes will eventually lead to slowly progressing hearing loss. Otosclerosis is usually genetic, so it runs in families. If one parent has the disorder, there is a 25 percent chance of the child developing it, as well; two parents have the condition that likelihood increases to 50 percent. Treatment options for mild forms of the disease include long-term observation or hearing aids. Sodium fluoride is sometimes offered to slow the progression of the disorder. In certain situations, a surgical procedure called stapedectomy is done to remove the hardened bones and replaced them with a prosthetic device.